Reflexology is a natural healing art designed to relax, detox and balance by enhancing the natural flow of your body's energies. Traced back as far as 2300BC in the physician's tomb of the Egyptian pyramids, Reflexology is indeed an ancient therapy that was also used in China, India, Japan and by Native American tribes. Reflexology is based upon the principle that there are reflexes in the feet that correspond to every gland, organ and area of the body. Through application of pressure to these reflexes, tension is relieved, circulation improved and your body's natural healing capacity promoted. As a general rule, if you are well, then reflexology can help you stay healthy. If you are unwell, it can help you recover and maintain your health! How Can Reflexology Benefit You? 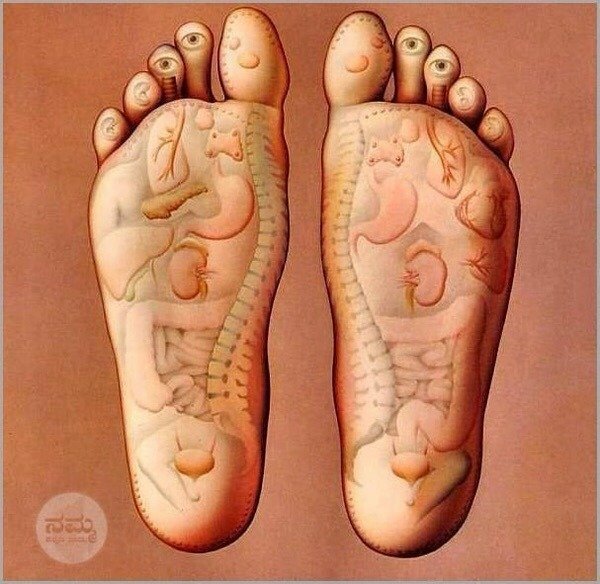 Everyone benefits from reflexology. This deeply relaxing therapy is used to maintain optimal health and in my experience it can also help to alleviate many common conditions. Reflexology can help with very general things as well as specific conditions. It helps support speedy recovery from everyday illnesses and may also ease the symptoms of many long term conditions. Reflexology cannot claim to cure or diagnose, instead Reflexologist's work alongside conventional medicine and other health professionals to further complement any medical intervention or treatment being undertaken. This is approximately a 90 minute session which consists of a consultation and investigation session. If necessary, a treatment plan can be formulated for future sessions. The 'hands on' time of these session last approximately one hour. GIFT VOUCHERS MAKE AN IDEAL PRESENT FOR MOTHERS DAY, BIRTHDAY OR SPECIAL OCCASION GIFT. Vouchers can be purchased for half hour or 1 hour sessions or a block of treatments. When should I visit a Reflexologist? Reflexology can be of benefit on many levels, whether dealing with physical, emotional or spiritual issues. Neither do you need to have to have a problem to benefit from a treatment.You can visit a reflexologist for the pleasure of being pampered and having a relaxing treatment or just to find time for yourself. However, you could also benefit from a treatment when you are ill, stressed or just feeling ‘under the weather’ and run down. Reflexology can help to ease pain and balance the bodily systems such as endocrine (hormones), digestive or circulatory systems etc. A first session lasts approx. 90 mins and includes a consultation where you will probably be asked about your medical history, diet, general health and any issues that might be bothering you. An exploratory session will then commence, where the entire area of both feet (along with the calves), are investigated for signs of imbalance. A record is kept of the information gathered during this session, and if required, a treatment plan can be formulated. Progress is evaluated regularly and treatment will be modified and adapted according to individual requirements. Through the course of a session, certain reflexes may be sensitive. These tender spots (known as 'hot spots'), can point to imbalances or problems within the body and may be linked to energy blockages which can develop through stress, illness, trauma etc. With gentle manipulation, the reflex on the foot gradually becomes less tender, which in turn can have a positive effect on specific problem areas of the body, at the same time easing away stress and tension. Relaxing music will be playing in the background as you are settled comfortably into a reclining chair or couch, with pillows to support the head and knees. A light moisturising cream is used to gently massage toes, feet, ankles and calves. At the end of a session, both practitioner and client will often feel thirsty and a glass of water will be offered. This can help flush out the kidneys and help the body rid itself of any toxins that may have been released during treatment. 'Hands on ' time for each treatment lasts approximately one hour. After a Reflexology treatment, reactions vary, depending on the person. However, it is common for your feet to feel warm and relaxed and you may feel sleepy or energised. Your body could feel hot or even shivery as your blood pressure changes when you are relaxed or revitalised. Generally the tiredness is short lived and is often followed by an increased boost in energy (especially after a good nights sleep). Many of my clients report an increase in energy levels with an improved sleeping pattern during a course of treatment. Occasionally, you may experience reactions when the body begins its self-healing process and elimination of toxins. Symptoms appearing to temporarily get worse before they get better. These reactions are only temporary and should clear in 1 or 2 days. 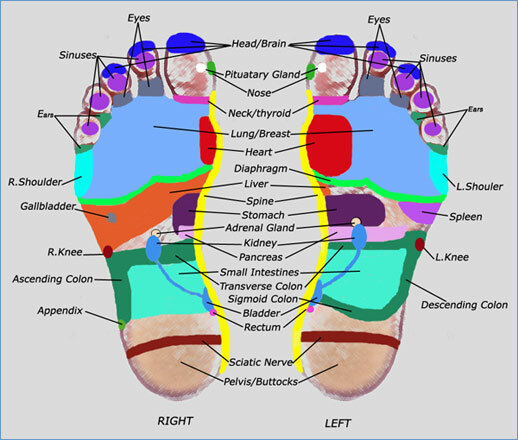 They are positive signals that your body has responded to Reflexology and is balancing itself. If reactions do not subside after 24 hours please contact Suzanne as we may be able to organise a short treatment to help relieve any reaction. After treatment, do take the time to relax and benefit from the session. Try to avoid alcohol for 24 hours, as the Reflexology could speed up the effect that this stimulant has on the body. Very occasionally, a person may experience an apparent worsening of symptoms for a longer period of time. (In rare cases, this can be for up to 4 weeks during the initial stages of treatment). This is part of the healing process (sometimes called 'the healing crisis') and at the end of this period, symptoms start to ease considerably as the body balances itself and comes back to homeostasis. Are there any age restrictions on who can have a treatment? Reflexology is a safe treatment for people of all ages - there are no upper or lower age limits. Children under the age of 16 will require parental consent before treatment can be given and an adult should be present during a session. As a general rule, sessions are shorter and gentler for the elderly and the young. A reflexologist will adjust the pressure which is applied according to what is needed for the individual. I'm funny about my feet being touched, will it tickle / hurt? People often fall into two categories - those who hate their feet being touched and those who love it! If you fall into the first category and are brave enough to 'give it a go', people are often pleasantly surprised how relaxing working the feet can be for the whole body. If you suffer from ticklish feet, then let me know and I will use a firmer pressure. It really doesn't take long for the ticklish sensation to die down and for people to begin to really enjoy their session. I use a measured level of pressure on the feet, which does not tickle, and is not painful. Sometimes where a reflex is imbalanced, the area may initially be tender, (like a knot in a muscle when someone massages it). This would indicate that these reflexes are out of balance and need work on them. Once I have recorded how sensitive an area is, I work very gently to ease away any discomfort and re-balance the reflexes. I always work to a comfortable pressure for the client, so the treatment remains relaxing and effective. How often should I see a Reflexologist? If you are in good health, and are looking to maintain this, I will usually recommend a monthly treatment to keep your body in balance, rather like servicing your car to keep it in tip-top condition! One off relaxation sessions can be booked as and when they are required. Many clients will book monthly, fortnightly or weekly sessions depending on their budget. When a specific problem or imbalance is being targeted, it is often more beneficial to have weekly treatments as the effects of the treatment are cumulative. It can take anywhere from one to four weeks for the benefit to be felt, depending on how severe a condition is and how long a person has been suffering from the problem. The treatments are cumulative and if the sessions are too widely spaced apart, particularly initially, it can be like starting from scratch each time. This could well result in treatment needing to be sustained for a longer period of time. Often, sessions can be stretched further apart as progress is made. This is usually best done gradually, allowing the body to adjust, ensuring that the benefits achieved will last. A course of treatment may need to be between 6 to 10 weeks duration, but this will vary depending upon the severity of symptoms and how long they have persisted. Sometimes one or two sessions is all that's required to bring relief!